The John Rylands Library took nearly ten years to build, starting in 1890 and opening to readers in 1900. For more about the Library, see our Enriqueta Rylands page. Note: Unfortunately, since the opening in 2007 of the Library's new entrance wing to the side of the original building, this work is no longer seen by many visitors, as it is necessary to walk to the far end of the Reading Room, or to the far end of the exhibition corridor, and descend Champneys' main staircase to reach the original main entrance vestibule. The detour is well worth the effort, however, to see the impressive architecture of this area as well as Cassidy's sculpture. On the brighter side, however, the view of the sculpture is no longer obstructed by a display of publications for sale. A working sketch, from the Library archives. Having no aesthetic use for this photograph, she used it to stiffen a bundle of book lists thus accidentally ensuring its survival, although badly faded and torn. Douglas A. Farnie: "Enriqueta Augustina Rylands, 1843–1908, Founder of the John Rylands Library". Bulletin of the John Rylands University Library of Manchester Vol.71,no. 2: 3–38. (1989). Full text available online. 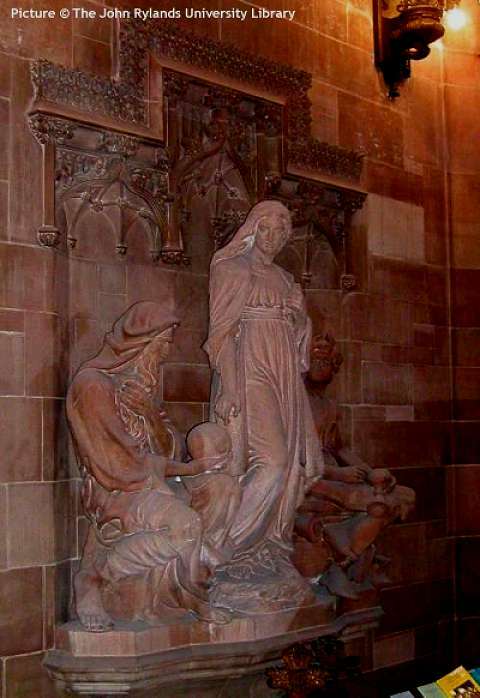 Cassidy's group Theology Inspiring Science and Art dominates the original main staircase of the John Rylands Library, although the similarity between its stone and that of the wall of the building creates a somewhat spectral effect, especially in a photograph. In the foyer a group of statues, placed in position in February 1898, symbolized the superiority of Theology to both Science and Art. The group of three figures embodied the founder's own idea of the library's essential function. Mrs Rylands wished to make the group the central feature of the foyer. 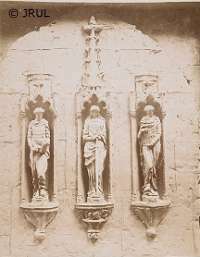 She insisted that the figures should stand out boldly from the wall and should not be cramped up in niches. 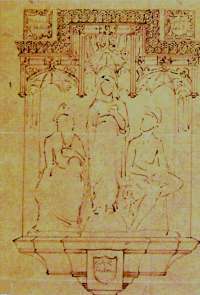 In 1893 she considered, in a letter written to William Linnell on 8 March, whether the central statue of Religion should be seated, with 'the shield of faith' and 'an open Bible'. In 1895 she thought the group might most appropriately be surrounded by the coats of arms of the four cities of Manchester, Salford, Wigan and London. She abandoned both of those ideas but remained firm in her commitment to boldness of treatment of the group. She would not accept a proposal by the architect [Basil Champneys] to moderate the impact of the central figure. Champneys thought that a six-foot female would have the effect of dwarfing the interior of the vestibule. He favoured a height of four feet six inches to five feet: in the event the height became five feet four inches. John Cassidy took three full years to complete the sculpture in red Shawk stone. The finished work embodied in full the vision of Mrs Rylands. The group remains the most inspiring work of statuary in the whole building. 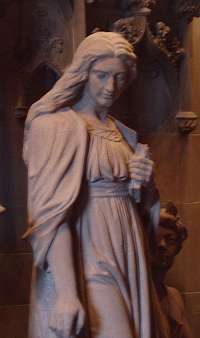 It impresses visitors powerfully with a sense of other-worldly values and is reputed to have been sometimes mistaken for a statue of the Virgin Mary, an interpretation which would have dismayed Mrs Rylands. Basil Champneys had, apparently, suggested Cassidy's London-based contemporary George Frampton (1860-1928) as sculptor, but he was overuled by Mrs Rylands, who insisted on Cassidy, who she already knew from his work on the statue of her late husband. She took a personal interest in the work (as she did in many other aspects of the Library), visiting the Lincoln Grove studio to view progress. The group is intended to represent Theology, Science and Art. 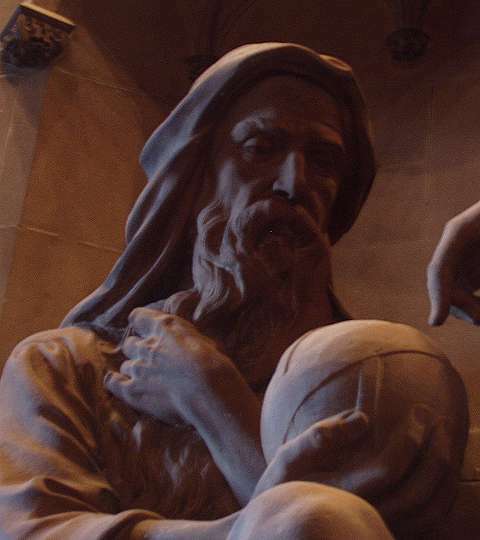 Theology, the central standing figure of a woman, clasps in her left hand the volume of Holy Writ, and with the right hand directs Science, in the guise of an aged man seated, and supporting in his hand a globe, over which he bends in study and investigation. On the left-hand side of theology is the seated figure of a youthful metal-worker, as representing Art; he has paused in his work of fashioning a chalice, and with upturned face listens to the words which fall from the lips of Theology. The lesson which this group is designed to symbolize and teach is, that Science and Art alike derive their highest impulses and perform their noblest achievements only as they discern their consummation in religion.